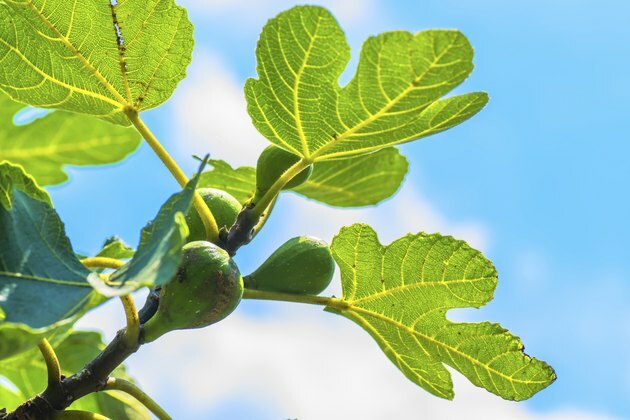 Once used to protect the privacy of Adam and Eve and adorn the bodies of Greeks and Romans, fig leaves are most commonly known for their spiritual and mythical symbolism. Although these large leaves do serve as adequate body coverings, they can also be transformed into a delectable dish. In fact, fig leaves are not only edible, but also provide various health benefits when consumed. Grown on the ficus tree, the fig is a nutritious and sweet member of the mulberry family. The mild fruits can be eaten whole and are usually eaten in a dried form. However, they can also be eaten raw, cooked, baked and grilled. Figs grow alongside bright-green leaves with a very distinct shape. The Dave's Garden website describes the fruit's leaves as "unique, deeply lobed, finger-like leaves." As explained on the Elements 4 Health website, consuming fig leaves can provide several healthy benefits for the body. Among these benefits, its anti-diabetic properties are among the most recognized. When consumed by a person with diabetes, fig leaves actually lower the amount of insulin required by the body. These extraordinary effects allow the diabetic to administer less insulin by injection, a costly and often life-long process. Along with their anti-diabetes properties, fig leaves also have been shown to lower the body's triglyceride levels. A triglyceride is the storage form of fat inside the body. Although a certain supply of triglycerides is required for proper health and body function, too many triglycerides greatly increase the risk for obesity and heart disease. However, a diet with regular fig leaf consumption may help lower these health risks as it gradually lowers triglyceride levels. Along with their remarkable anti-diabetes and triglyceride-lowering effects, fig leaves are also used in a variety of other home remedies for various medical conditions. In fact, the Natural News website recommends the mild leaf for conditions ranging from bronchitis to ulcers. According to the website, fig leaf tea can be beneficial for cardiovascular problems, cancer patients and people with high blood pressure. To make fig leaf tea, simply boil fig leaves in water for at least 15 minutes. A home remedy for bronchitis involves boiling water with three fig leaves and piloncillo, an unrefined sugar. A home remedy for ulcers involves chewing and swallowing two whole fig leaves daily. Although fig leaves are edible, they are used in very few recipes. In fact, Dave's Garden website acknowledges that fig leaves are typically only used to "wrap around foods." For example, the Saveur website features a "Grilled Sea Bass Wrapped in Fig Leaves" recipe, while the Martha Stewart website features a "Salmon Wrapped In Fig Leaves" recipe. The leaves can also be used as a wrap for rice and vegetables, giving the dish a Mediterranean flavor.